Keeping your robomower is tip top shape throughout the mowing season is imperative to keep maintain the health and wellbeing of your garden. Now I may have made this sounds like hard work but in fact it is fairly easy and most jobs can be done in five minutes. Below I will talk you through everything you need to do and how to to do it all correctly. Always switch off the Safety Switch of your mower before checking and cleaning it or replacing the blade. Never attempt to service or adjust the mower while it is in operation. In case of abnormal vibrations, stop the mower, switch off the Safety Switch and check for any damage of the blade. Replace worn/damaged blade to preserve balance. If vibration continues, call for service. Use only the original equipment and accessories. It is not permitted to modify the original design of any Robomow mower. All changes are made at your own risk so please don’t bother. Make sure you check up on your blades on a regular basis. You will only need to replace them if they begin to get blunt and at the beginning of the mowing season. Put your gloves on and lift the mower so that it’s sitting at an angle against a wall or a similar surface. Insert the clamp side of the Blade Removal Tool into the open slits beside the locking tabs on either side of the blade. Turn the Blade Removal Tool slightly so that the clamp resides on top of the locking tabs on either side. Squeeze the handle of the Blade Removal Tool so the locking tabs on each side of the blade will be pressed. Now put on the new blade. When reinstalling the blade, line up the mating splines and push until a firm click is heard, indicating a proper seating of the blade onto the shaft. Please Make sure to check out Amazon for the best prices and selection for your blades. You really won’t find anywhere better. 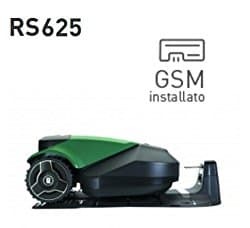 Because Robomow mowers have a mulching function, they will gather a lot of grass and other debris under their mowing deck. This means you will have to cater to this on a regular basis. Please make sure you follow the tips below to do this correctly. Carefully scrape the collected grass & debris from under the mowing deck. Most of this grass can be removed using a small wooden stick or similar object, such as a screw driver but just make sure you aren’t causing any damage. To get better access to the mowing chambers you can remove the mowing blade. When you’re cleaning, never use a hose or a power cleaner. This will only cause damage to the mower. Use only damp or wet cloth to wipe the surface clean after scraping. To make sure your mower stays safe during the winter period and so that it can operate properly for the nest mowing season, please bring it inside. Store it in a dry and cool place, away from children and frost, like in a storage room. This will make sure the mower is safe from the cold and wet weather, keeping it in prime condition for the upcoming season. Also, make sure you clean it before putting it away. And if you want to go a step further you can get your mower serviced by a certified Robomow dealer. This will keep your mower in even better condition and will only improve its maintenance. In fact, Robomow have actually recommended you to do this every year so may be worth checking out. This winter service will include; cleaning mower’s parts and mowing deck, checking for worn parts (such as blade, drive wheels and other moving parts) and then replacing them if required, testing mower’s functions and safety components, checking the battery, and uploading a latest software version, possibly including newly added features. This will cost you some money but will be worth it considering how thorough the check is. It may even save you some money in the long run as well. So make sure you follow all of the advice above. If you want your garden to be in the best shape possible then you need a mower that is too. They are all very important so please carry them out regularly.